The graceful and timeless paisley motif is emulated throughout this book on 31 ready-to-color plates. Inspired by traditional floral designs, birds and more, this book has something for colorists of all ages and artistic styles. The pages have been perforated so you can easily display your work. The designs are simply amazing and fun to color while you create your own personalized works. This coloring book is wonderful for people of all ages, with detail and complexity on each page. Create one-of-a-kind treasures with these unique, creative designs. Show your true colors and let your imagination run wild! 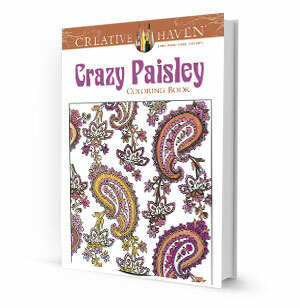 Includes 31 timeless paisley motifs. Inspired by traditional floral designs, birds and more!